I have waffled on the whole sous vide cooking process for a few years, but decided to give it a try when the Sansaire was on Kickstarter. 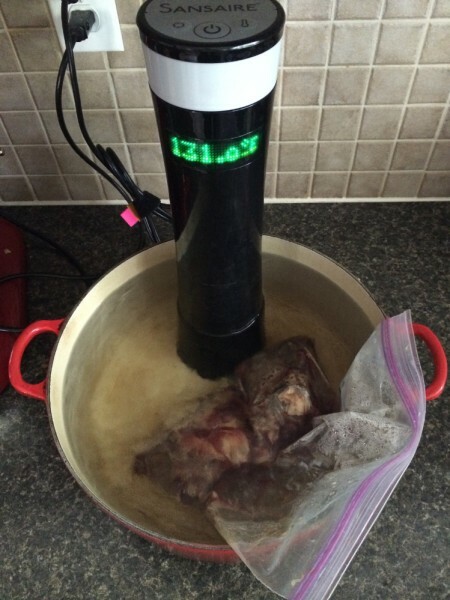 Sous vide is basically cooking food in a water bath that is kept at a set temperature: because the food is submersed in the water its temperature can never exceed that of the water. While happy with my purchase it languished in the cupboard for months. 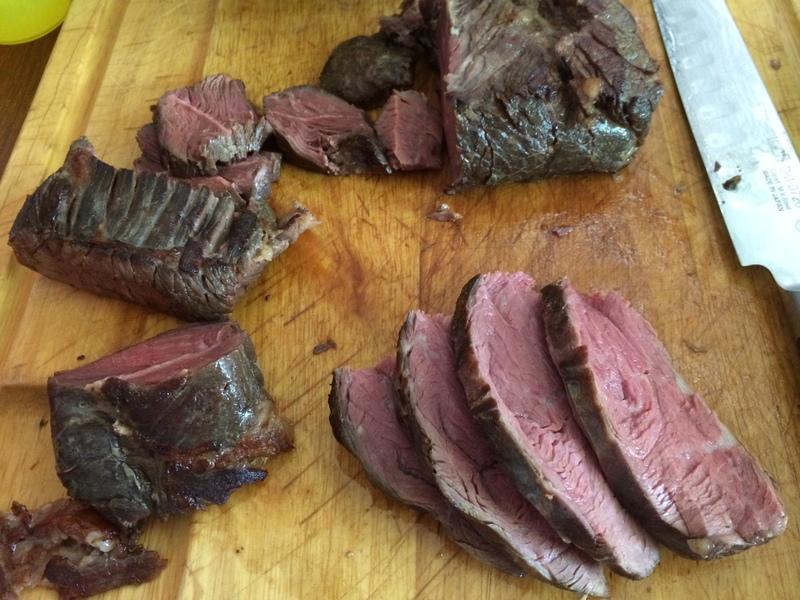 I love grilling and barbequing and it never felt like the right time to sous vide, until last weekend. 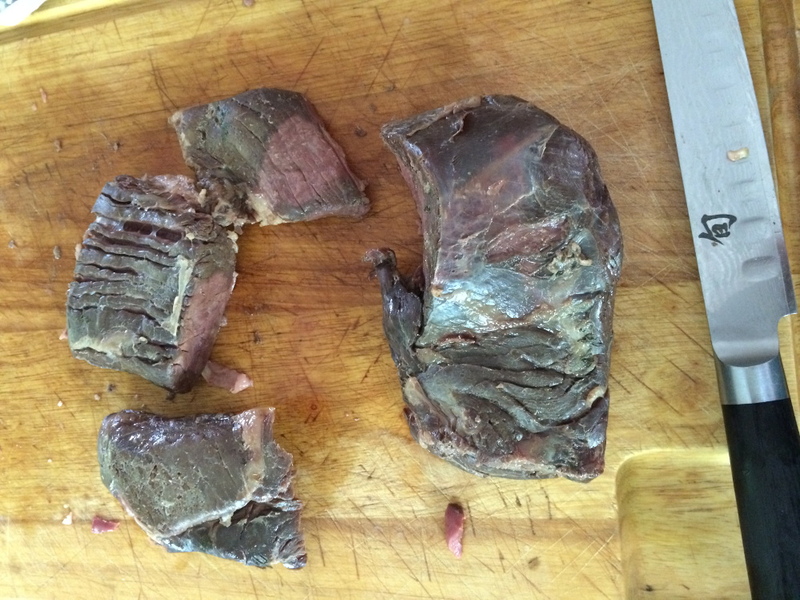 I had what I thought was a chuck eye that turned out to be nicely marbled chuck roast. I could do a pot roast or finally crack out the Sansaire and cook my first sous vide meal. I used my largest Le Creuset pot, a heavy Ziplock freezer bag and let it cook for 24 hours at 131 degrees Fahrenheit, as you can see in the picture above. I had seasoned the roast the day before with Herb and Garlic Sea Salt and slightly trimmed it removing sinew and silverskin. After 24 hours I removed the meat: it was gray and unappetizing looking, but I was expecting that. A quick sear in a blazing hot cast iron pan produced a nice looking crust. Carved it was a wonderful medium rare and very tender. The leftovers made beautiful steak sandwiches. The process was very straightforward and I can see the benefit for tough cuts of meat that require long cooking times. I’m not sold on steaks or chops since the crackling fat and crust from a charcoal fire are part of the eating experience for me. It’s worth noting that since the meat’s temperature is all at 131 degrees once you take it out of the bag is starts cooling so you need to eat it immediately, no resting required.